Each month at JCMS a Unified activity takes place as part of their participation in Special Olympics Unified Champion School program. 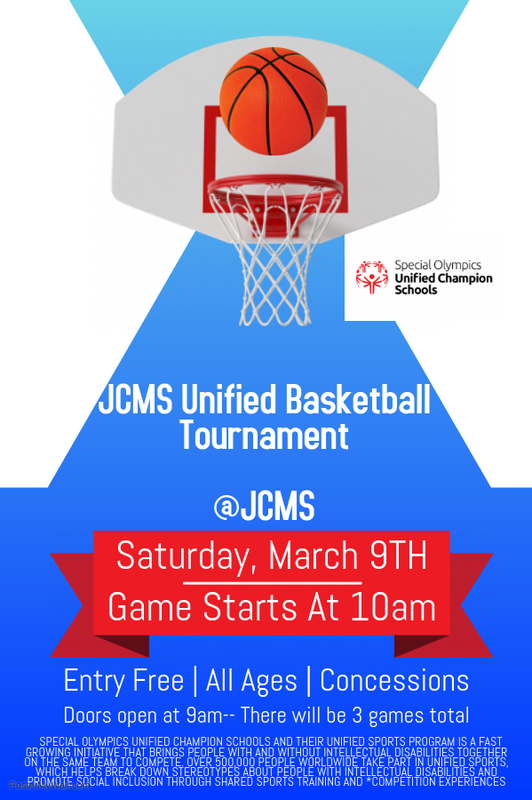 This month all students were invited to create a poster to advertise for the upcoming Middle School Unified Basketball Tournament that JCMS is hosting next Saturday, March 9th. Over 100 students turned in entries, which had to be created on their computers, and one winner was chosen. 5th grader Brady Maxeiner's design was chosen as the winner and he received the prize of $10.00 and a Rock-n-Respect T-shirt! You will see his design posted on social media and hanging up at each of the schools in the district. The Middle School Unified Basketball Tournament opening ceremonies will begin at 9:30 and the first game starts at 10:00. Admission is free. Come on out and watch our Jersey Panther Unified basketball team compete with other Unified teams from Illinois. Unified Sports brings people with and without intellectual disabilities together on the same team to compete!